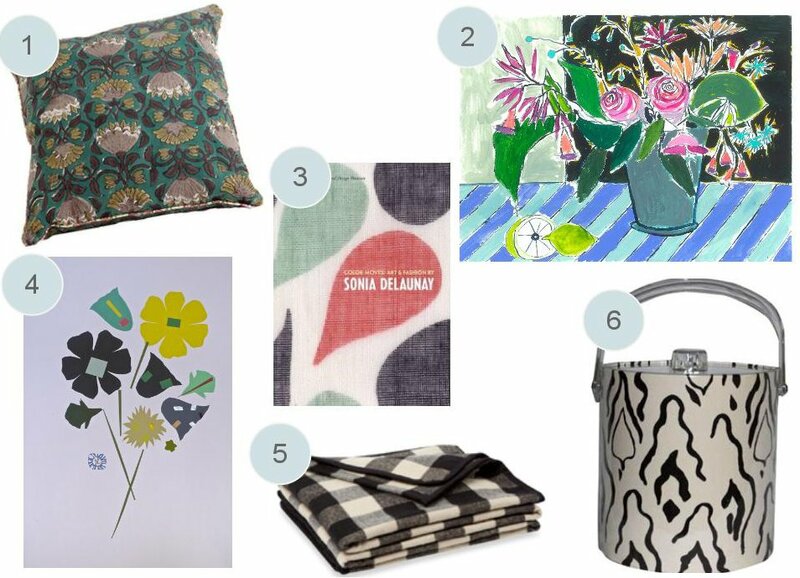 Do you have someone on your holiday shopping list that isn't afraid of a little pattern or print? I thought that this year, I'd round-up some fun gift guides for the idiosyncratic and less-than-typical person on your shopping list. If you had me on your list, you know I'd be pleased with any of these printed presents. It's been two years since we moved into our 'lil apartment and, over time, Adam and I have slowly occupied nearly every corner in this place. Storage is limited around here but, because we are not planning on buying a house just yet, we had to figure out a way to best maximize space. I had been frustrated by a nook in our "den" that served no real purpose for a very long time. As you can see, this awkward, unused little area was large enough for an awkward little 5' 3" woman to fit into. Really, it was wasted space. 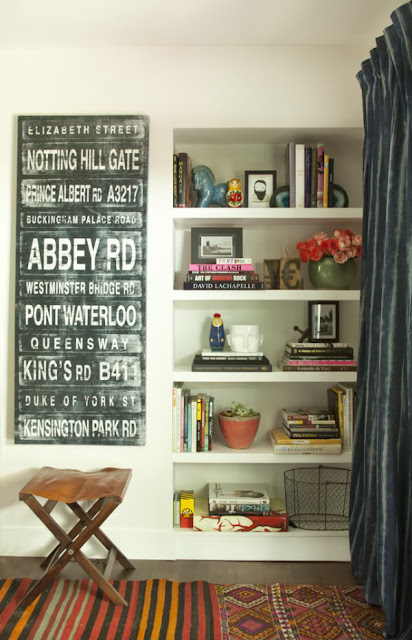 After Amber shared her DIY book nook months ago, I knew I wanted to try my hand at a built-in nook of my very own. Certainly you're familiar with Amber's gorgeous little series of shelves. To be specific, the nook I was working with measured 84" from floor to ceiling, 14" in depth, and 46.5" long from wall to wall. And just to keep things interesting, the corners were not exactly square. Little architectural quirks like this certainly keep me on my toes with projects around this apartment. First to go up were the shelf rests/batons, which were made from MDF. These rests were screwed into the wall and were about 1/2" at the widest point. 1/2"-thick MDF were cut into sheets and were placed on the MDF rests. The shelves were coming together! The MDF shelves were fully secured using screws and, for extra hold, wood glue. We clamped the MDF pieces together and let the glue set for a day or so before proceeding with paint. Note: Adam and I chose to go with MDF because, let's be real, this is a rental. If we were building floating shelves in our own home, we'd use pine like Amber did. The shelves really started looking like something with a little paint. Rather than opting for a bold color, I chose to paint the floating shelves in the same off-white paint as our apartment's walls. 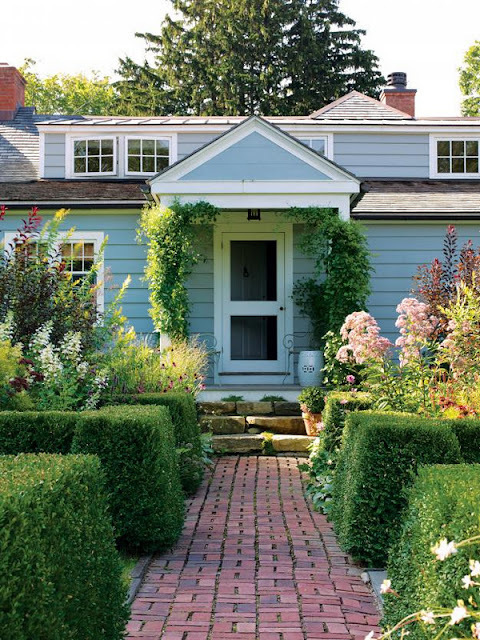 This way, they felt permanent and intentional. Forgive my lack of super-inspiring styling, but I have so much extra surface area for tchotchkes, books, framed pictures that I don't have enough! 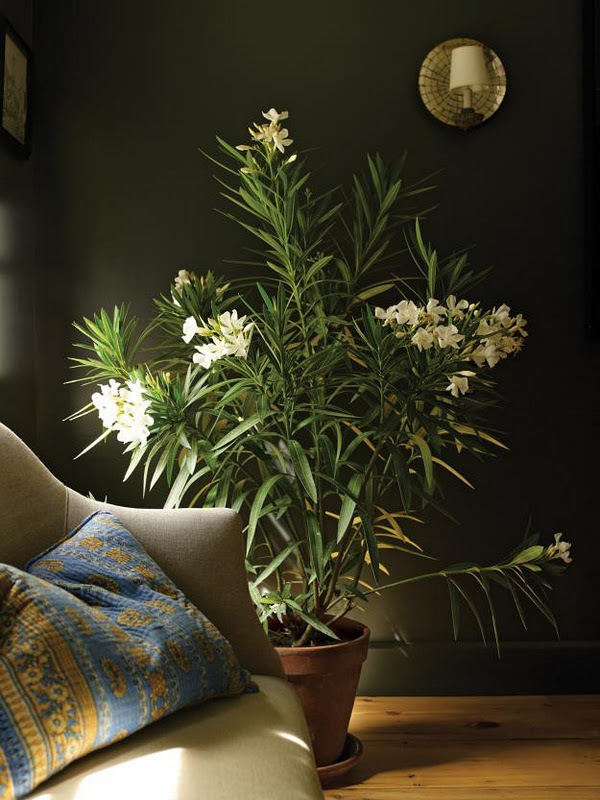 It's definitely not a bad to need to find more special treasures to fill your home, is it? Now my "nothing" nook has purpose. The three floating shelves are permanent, and will stay in this apartment (hopefully) long after we depart. I think they fit in perfectly and have inspired me to work on a few more projects in the den that I'll be sharing over the next few months. So, we managed to make something out of nothing. And in case you're curious, NO, we do not plan on taking these down when we move out. I'm sure our landlord will love them (if he even notices at all)! Much of last week was spent enjoying quality time with my parents and extended family. To see my grandmother, aunts, uncle, cousins and their children, Adam and I traveled to Maine for a few days. 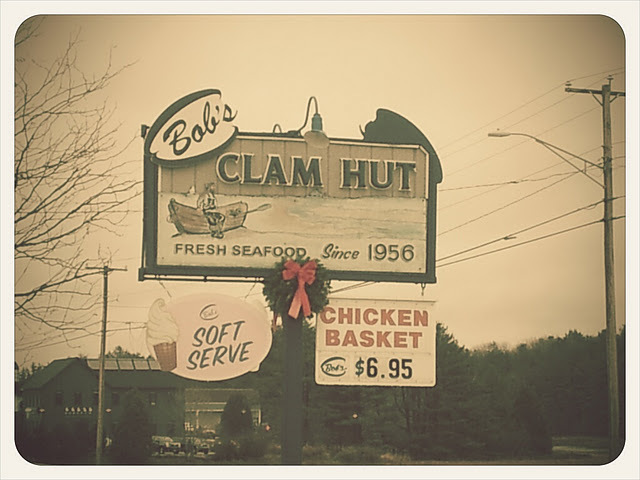 On our way through Kittery, Maine, we stopped at Bob's Clam Hut on Route 1. The food, even in late November, was fresh and yummy. 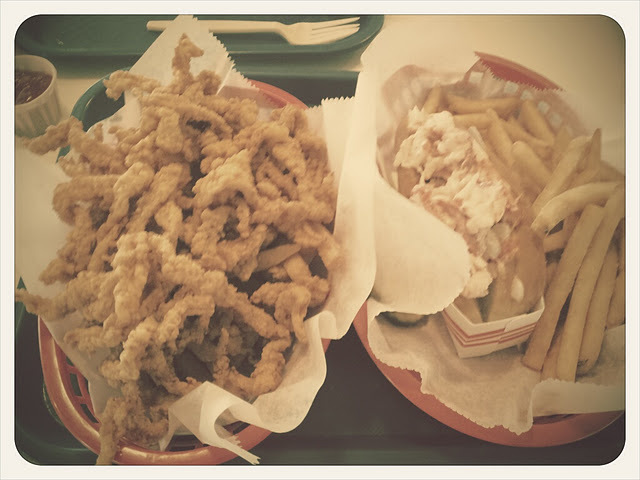 Adam ordered the lobstah roll and I ordered a clam strip basket, which doubled as a funny moustache in a pinch. 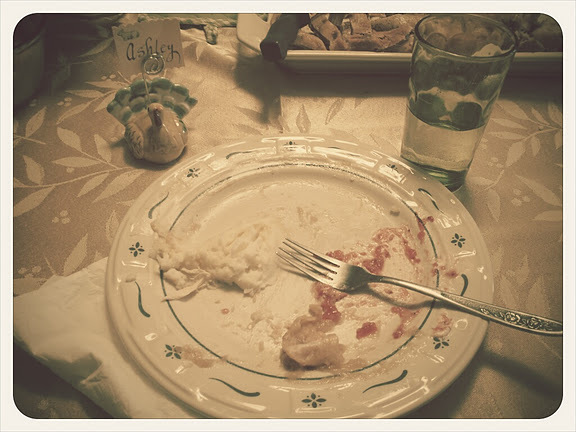 On Thanksgiving, I was sure to clean my plate. 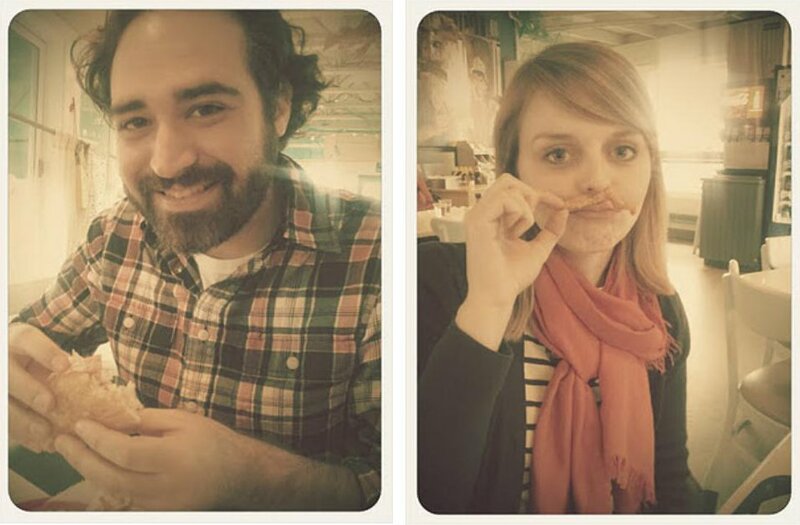 There was a lot of good eating happening during the past week. I mentioned on Friday that I was opting-out of the Black Friday craziness and, instead, shopping for vintage wares for (hopefully) good prices. Well, well, welly, well, well...did I find some goodies or what!? 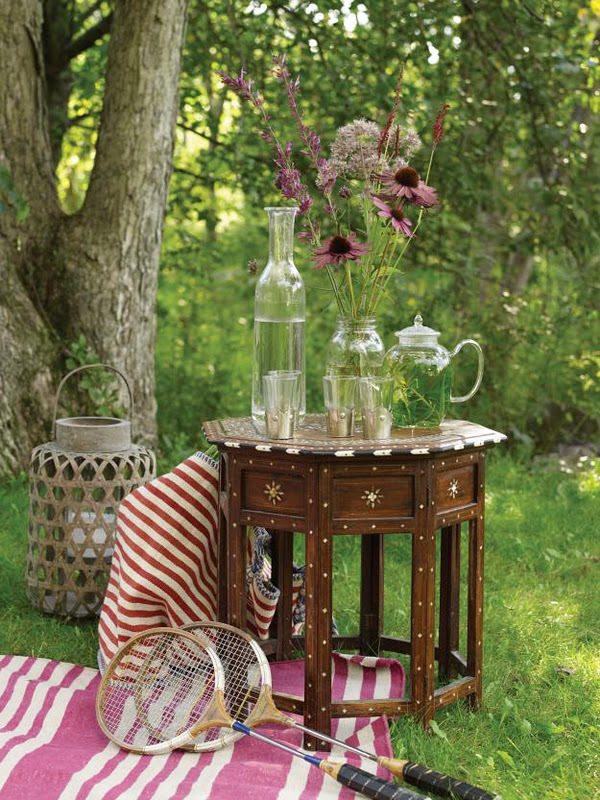 'Member my recent obsession with Moroccan tables? I found one for $22 and my mom thought it would be a great early Christmas present for me! I also found a fab scrollwork shelf for my bathroom (for $12!) and three vintage ornament decorations (for $28). 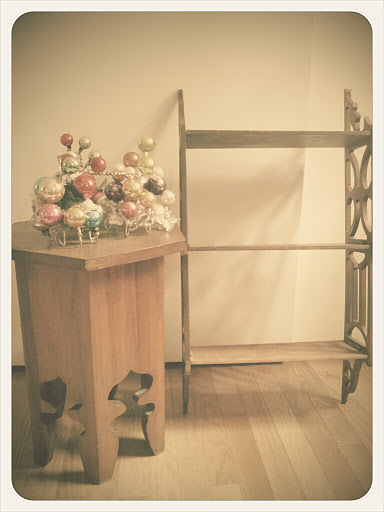 I love my new treasures. 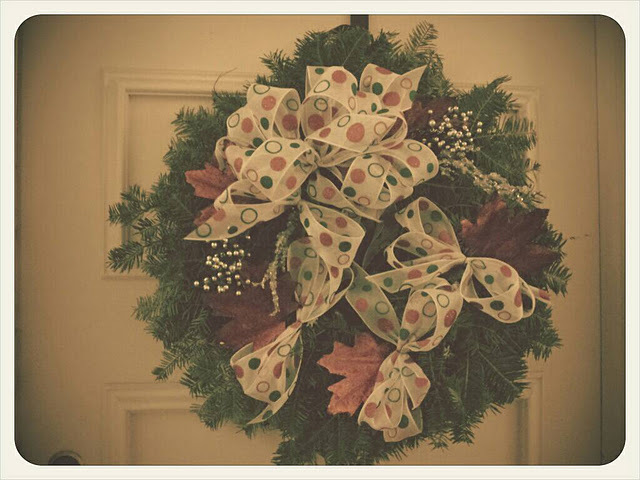 Aaaaaand, last but not least, Mom made a beautiful wreath for our apartment door--isn't it pretty? Hope you and yours had as great a Thanksgiving holiday as I did. Now on to the Christmas season! I hope that you all had your bellies filled with great food yesterday and are ready to officially start the holiday season. I personally cannot wait to break out my Christmas decorations and begin decking the halls. Adam and I are visiting my extended family in Maine for the Thanksgiving weekend, and are opting-out of the "door buster" madness in exchange for some local antique shopping. Wish me luck hunting some great vintage finds. During the passing year I have experienced a number of substantial changes in my life and, despite fears and uncertainty, I have been so fortunate to feel unending support from family and friends. This Thanksgiving I can't help but feel an abundance of gratitude for the the special people in my life. I also feel so grateful to have lovely readers like you all. It means so much that you spend a few moments of your day with me here at Meet Me in Philadelphia. 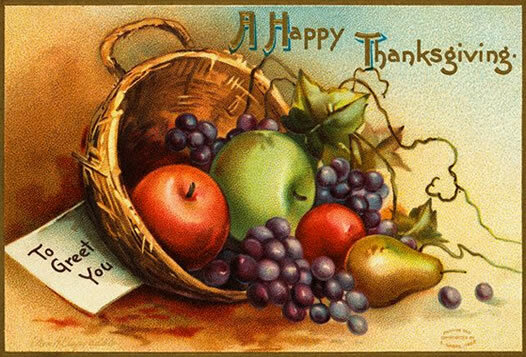 Wishing you and yours a wonderful, blessed and happy Thanksgiving today. It can be difficult at times for me to see outside of my own situation which, despite being unemployed, is comfortable and fortunate. And yet, there are constant reminders that others are not so comfortable or so fortunate. Congratulations, Danielle of Fresh Quince! Danielle, I'll be contacting you for your details. Wishing you a wonderful Thanksgiving tomorrow. Let me begin by saying that I fully intend on sharing my repainted Chippendale-style mirror with you all, but can we pause for a minute and just talk about the connotation I have with the word Chippendale? Both are glorious reminders of the late eighties-early nineties. Now, back to the subject at hand, my $30 Chippendale mirror, which started out with an unbecoming glossy cherry finish that did not blend with the other tones in my living room. I solicited color advice from you geniuses a few weeks back and finally got around to painting the mirror. I know it's a bit unorthodox for a home decor blogger to paint something off-white, but that's exactly what I did. 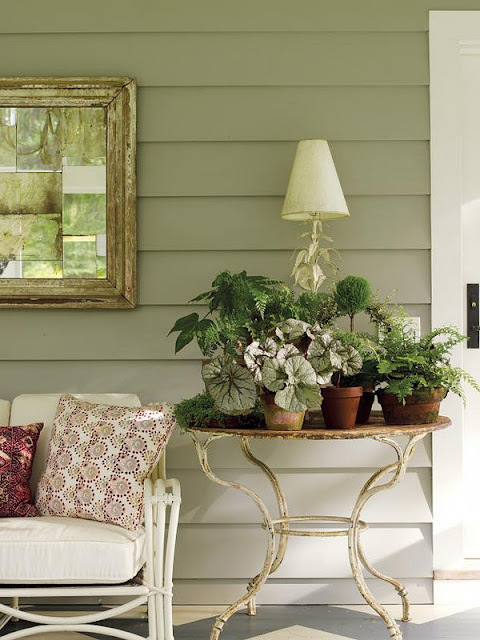 The paint was from Martha Stewart's Home Depot line (the color is "glass of milk") and like the the mirror both recedes into the wall and, yet, still has a presence thanks to its silhouette. 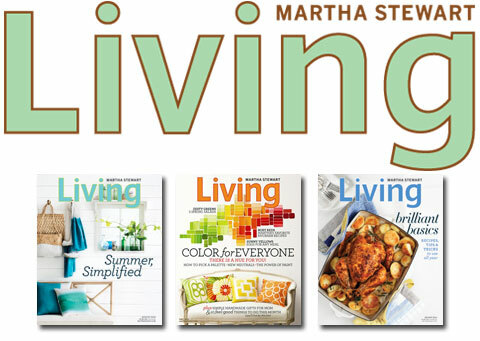 Today is the last day to enter the giveaway for a one-year subscription to Martha Stewart Living! 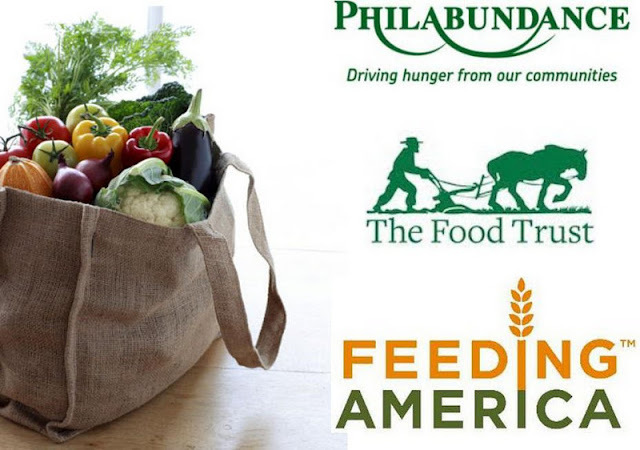 All you have to do is be sure to be a follower of this blog & comment here. A winner will be announced tomorrow! I'm not crazy about cooking, honestly. 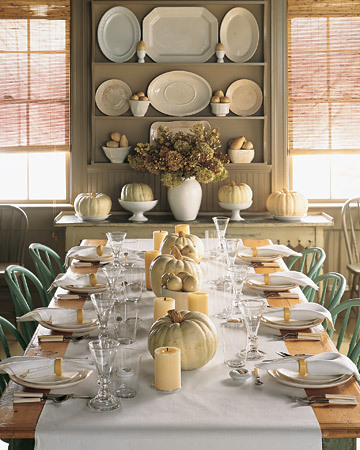 So, if I were hosting Thanksgiving, I'd devote most of my time on the decor. 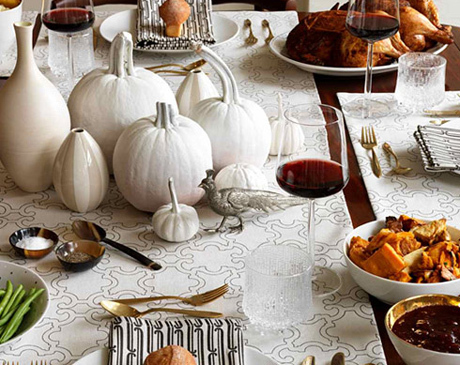 Still need more Thanksgiving spread inspiration? 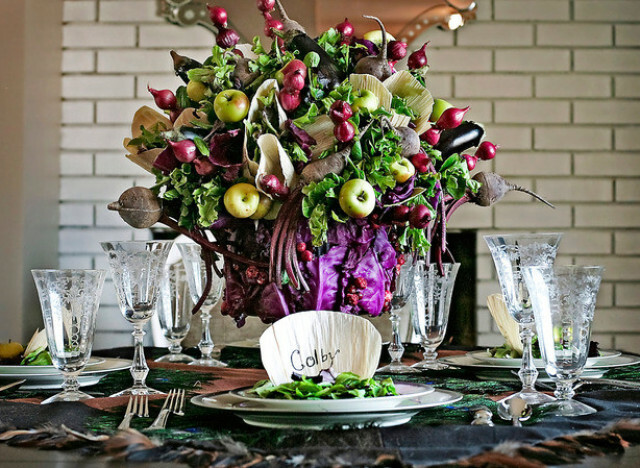 I'm sure you've all got a beautiful and scrumptious Thanksgiving holiday feast planned for Thursday! 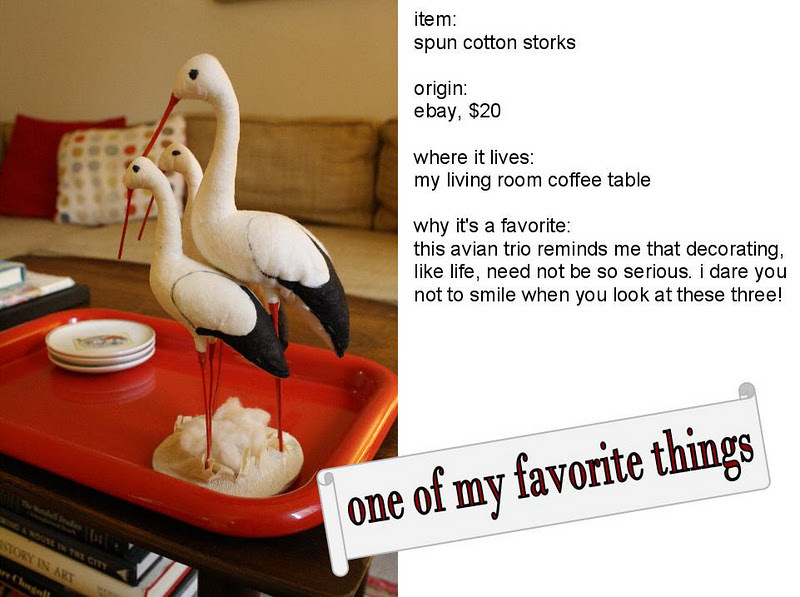 I hope you all enjoyed the week-long series where I shared just "a few of my favorite things" and some of yours, too. Really, there are so many more favorite things I love throughout my home. Let's see, there's the matching pair of marble lamps in my kitchen, my two Claire Nereim calendar prints, my extensive collection of Martha Stewart Living magazines (as far back as '94)...clearly, I could go on. 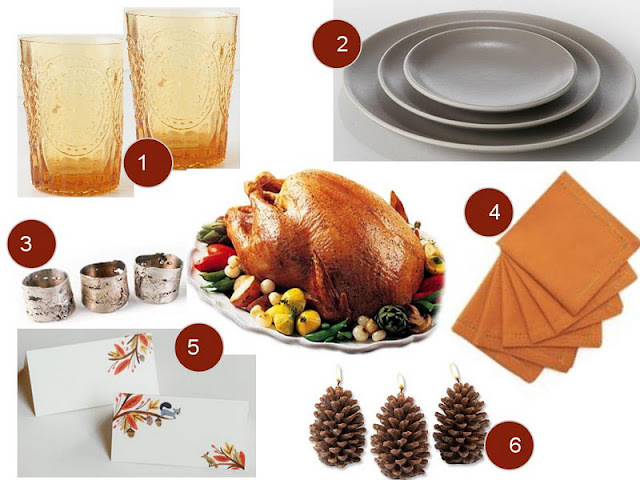 Since this is the season to be thankful and giving, I wanted to giveaway one of my favorite things: a one-year subscription to Martha Stewart Living magazine (worth $25)! Make sure you're a follower of Meet Me in Philadelphia and comment below! 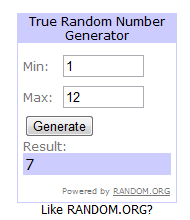 Be sure to have a valid email address so I can contact the winner for their address. The giveaway will be open until Tuesday, November 22 at 8PM EST and a winner will be selected using random.org. Check back on Wednesday, November 23 to see if you've won the subscription! And thanks again for taking time to visit Meet Me in Philadelphia--truly, you all are of my favorite things! I'm so excited for today's post, and I am so happy to share with you the favorites of some of the kindest readers out there. Enjoy! Today's first favorite comes from Anathalia, who has been a faithful reader of this blog and so, so kind in her comments. 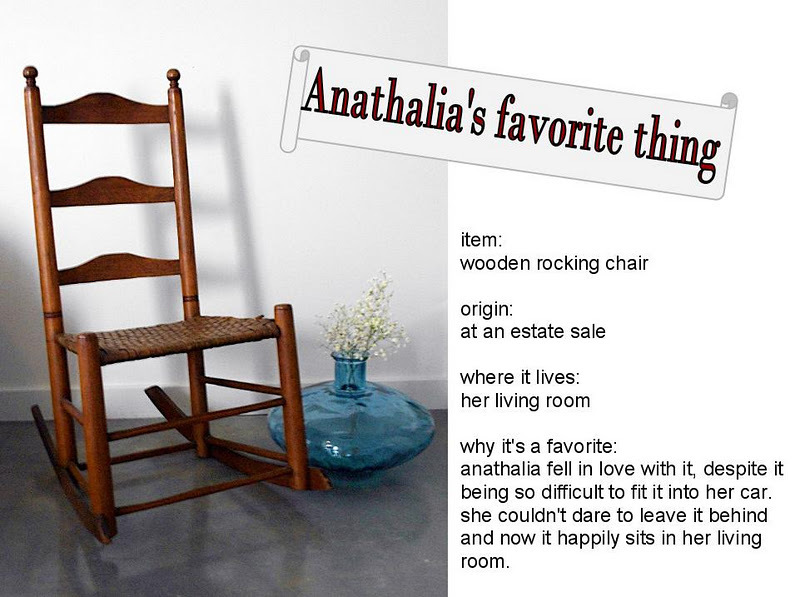 It's easy to see why Anathalia would have a soft spot in her heart for this rustic rocking chair, isn't it? 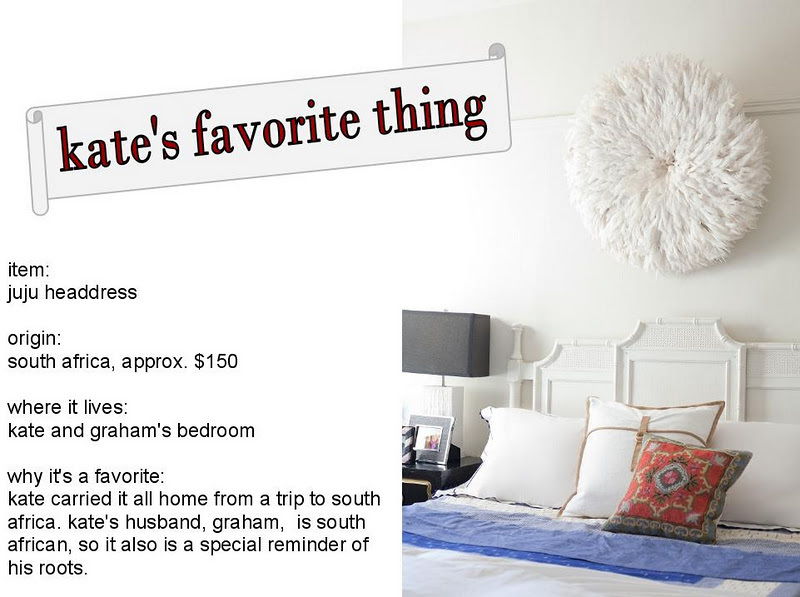 Kate has an eye for trends because her favorite thing, an African Juju headdress, is frequently the subject of blogger lust. 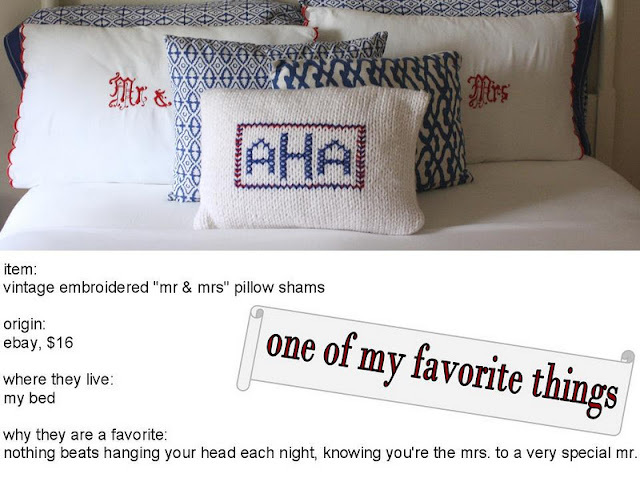 Apartment Therapy also wrote about these headdresses just this week. More than just a trend though, Kate's favorite thing has a very special connection to her husband's family. Kelsey's favorite thing is actually a pair of items that, together, represent family. 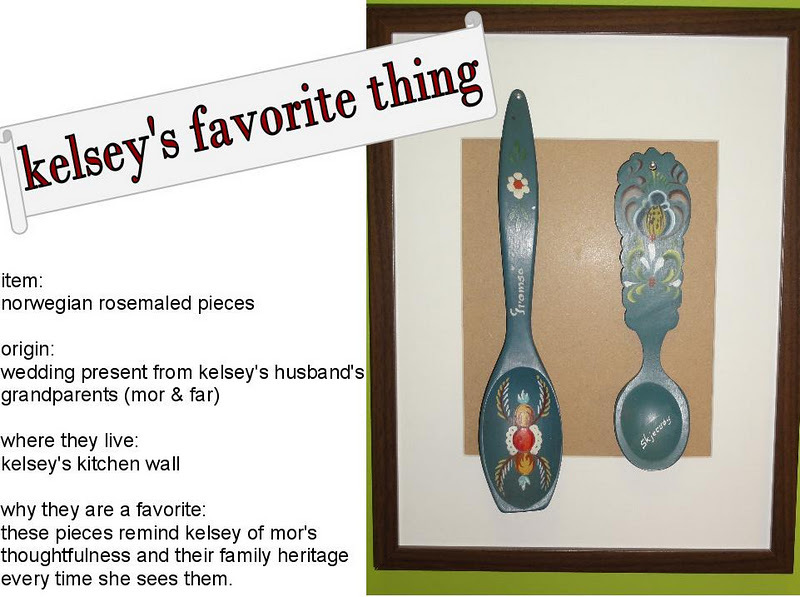 I love that Kelsey decided to display these handpainted wooden utensils as a way to honor their meaning. 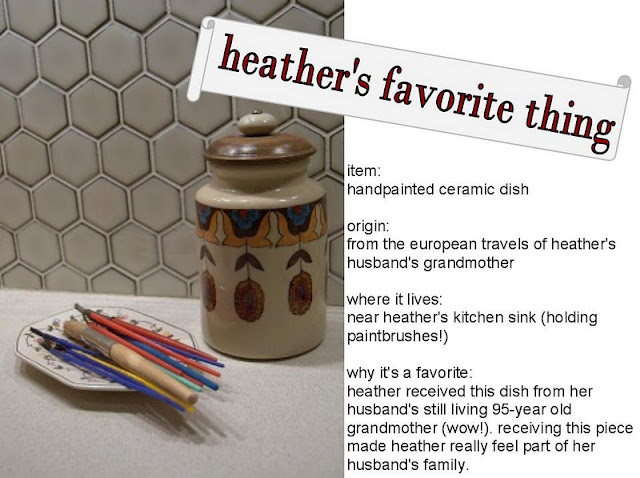 Heather, who is so kind and creative, emailed me saying that she had such a hard time all week trying to narrow down her "favorite things" to just one--isn't that great? Shouldn't we all have a home full of things we treasure? Lovely local reader and blogger Kat emailed me with a fabulous repurposed yard sale find that I just love. 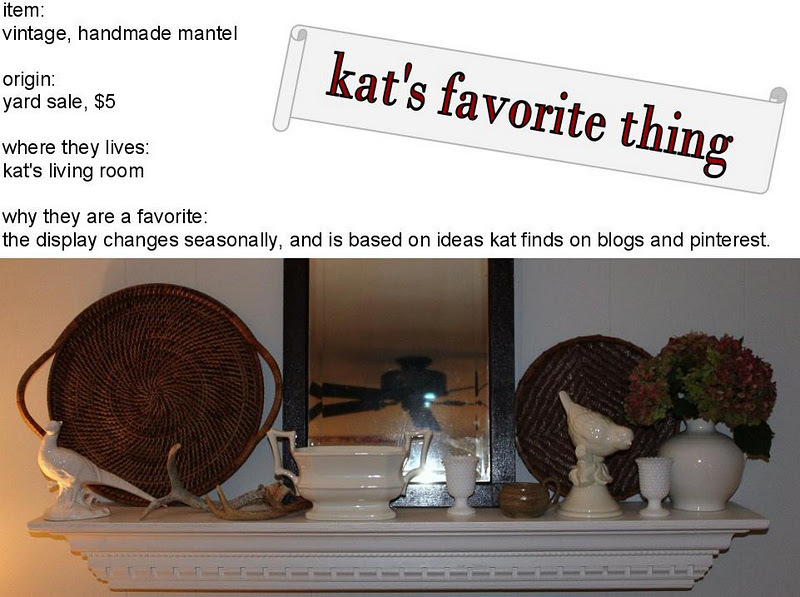 If you get an itch to switch things up and move things around every now and then, you will love Kat's favorite thing! 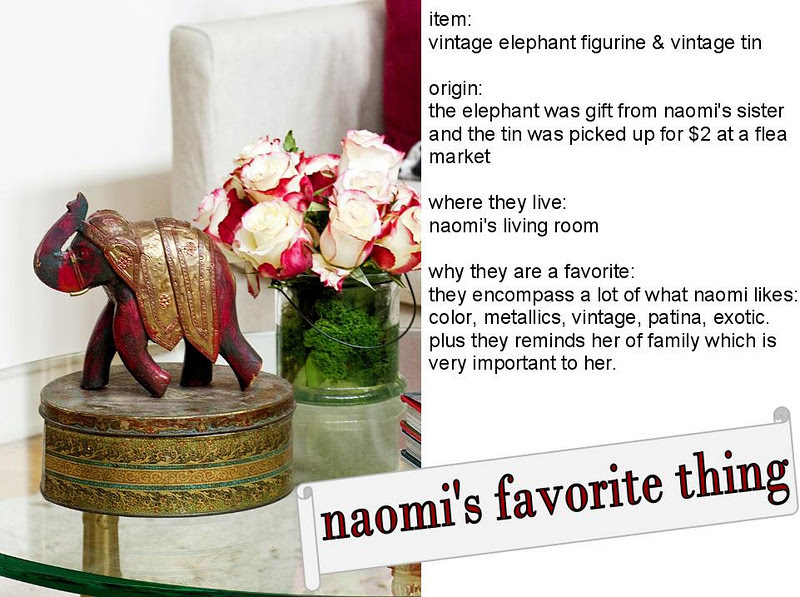 Last, but most certainly not least, we have Naomi's favorite thing (two things, actually). If you're familiar with Naomi's boho-glam-world-traveler look at all, you will see how perfectly these favorite things personify her style. 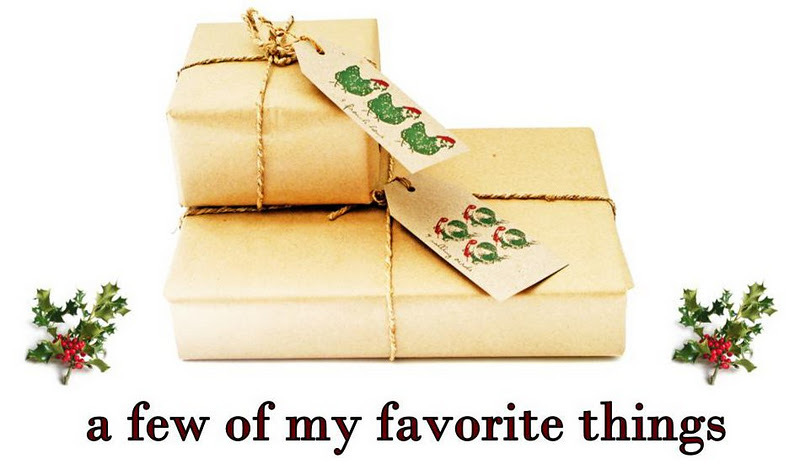 How awesome are these favorite things? I love that so many of them have a direct connection with family--clearly our family connections shape so much about our homes. Thank you so much, ladies, for choosing to share these favorites with me (and other Meet Me in Philadelphia readers). Thank you all for joining the "favorite things" party and hope you enjoyed the fun! For today's installment of my week-long "Favorite Things" series, I thought I would take you all into the second bedroom I lovingly redecorated this past summer. I'd love to be able to display one-of-a-kind artwork in my home, but that doesn't exactly work with my budget right now. 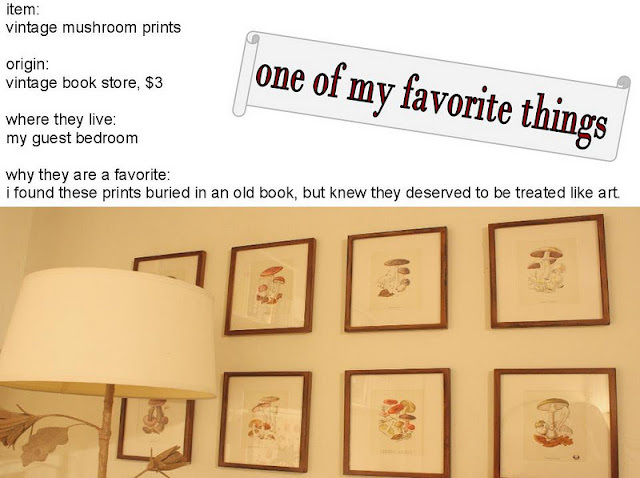 When I happened upon an old book on mushrooms, however, I found a set of coordinating prints that were perfect for the once-blank wall space in my guest bedroom. These prints add a natural, albeit slightly weird, element to my guest bedroom and they are definitely some of my favorite things! If you want to submit your favorite thing, there's still time! Just email me by this evening with a photo of your favorite thing, a description of it, an explanation of why it makes your house a home, and where it lives in your space. Your favorite things will appear on Meet Me in Philadelphia tomorrow! Today I have two more favorite things to share with you all, both of which are subtle reminders of being totally, completely in love. Hope you'll agree that these pieces are easy to "love". The Greek tile and the embroidered pillow shams, when glimpsed, both remind me to celebrate these early days of my marriage and to treasure the commitment Adam and I have made to each other. Our home is built on and decorated with love. Are some of your favorite things reflective of your most loving relationships? Welcome to a new week, blog friends! Starting today, I'll be sharing some of my favorite things around my home. It's easy to become consumed with the need for new things, better things, or prettier things when blogging; but I wanted to take some time to consciously celebrate what I am grateful to already have because, really, I am very fortunate. 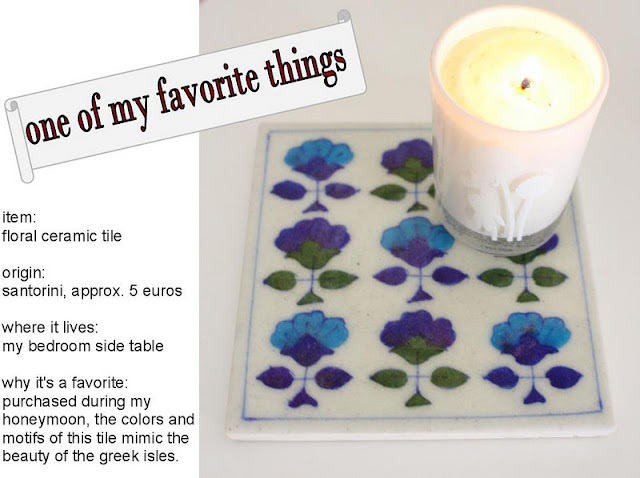 I hope you'll enjoy this little exercise and will join in (I'll be sharing your favorite things on Thursday--so email me with something in your home that you love to pieces, and I'll be sure to include it!). Most people who know me would characterize me as a serious, quiet person, but the truth is: I can be silly and lighthearted, too! These vintage spun cotton birds, strangely enough, remind me to let more of that silliness show whenever I see them. 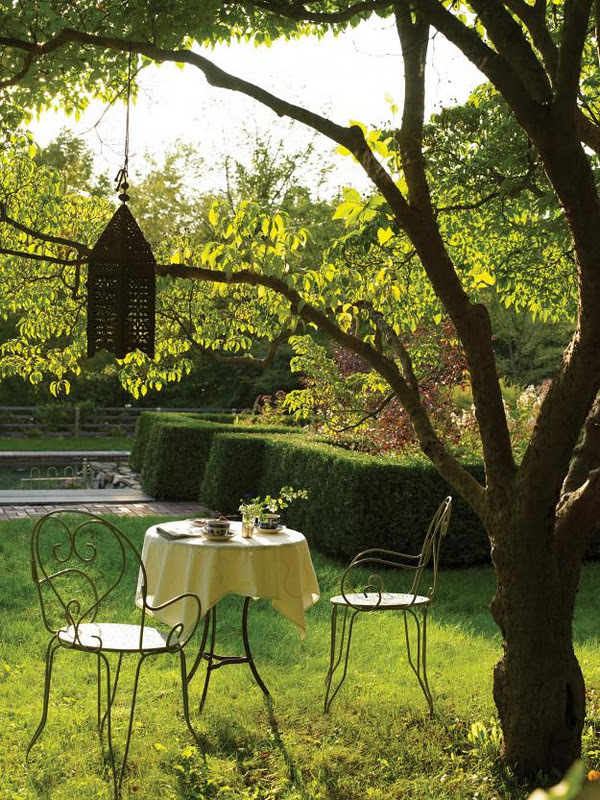 Life, like design, benefits from unexpected humor and irreverence. So, why not display it? Join me tomorrow for another of my favorite things. Here we are at the end of yet another week, and also at Veterans Day. Several members of my family, including my father, uncle, brother, sister-in-law, and cousin, are veterans of the U.S. Armed Forces and have served in conflicts in Vietnam, Bosnia, Iraq, and Afghanistan. 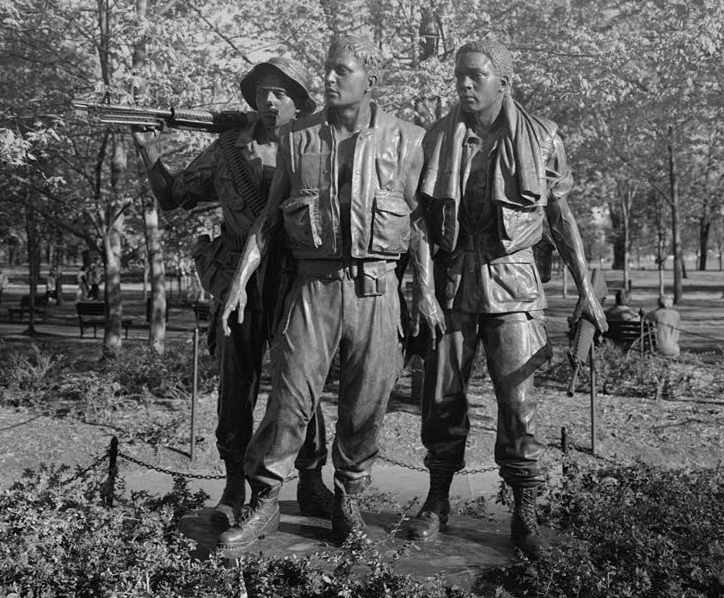 While I'm a pacifist through-and-through, it is important to recognize, honor, and continually support those brave citizens who have given their time, efforts, and possibly lives, for this country. I hope you'll join me today to be thankful for the commitments and sacrifices that these honorable men and women have made. On a related note, I wanted to remind you all that next week will begin the "My Favorite Things" series around here at Meet Me in Philadelphia. 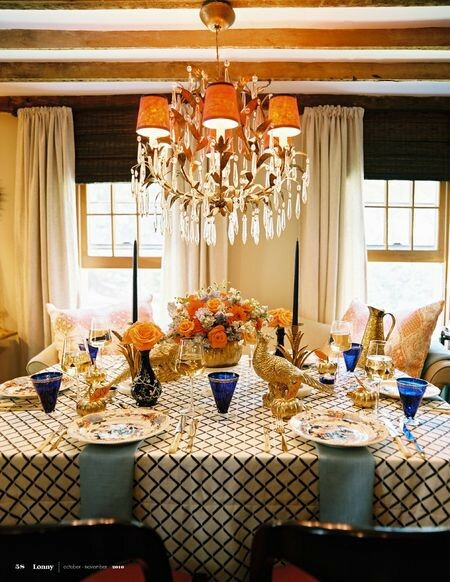 I'll be sharing some items in my home that I'm thankful for and I've invited you to submit your favorite things to appear in next week's feature. I'd love you to join in! All you need to do is email me with a photo of your favorite thing, a description of it, an explanation of why it holds a special place in your heart (or even just makes you smile), and where it lives in your home. If you've already submitted your favorite thing--thank you! If not, what are you waiting for? After all, 'tis the season to be thankful. 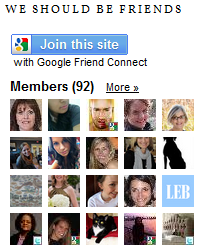 I'm so blessed to have this creative blogging outlet and to have wonderful readers like you!